As well as the bamboo casing, it also features other green design ideas such as a stiffened cardboard components enclosure, and recyclable plastic parts that are correctly labelled so they get recycled in the right way. Apparently its manufacture also avoids the use of harmful paints or sprays, and there is no electroplating on its circuit boards. The bamboo casing can also be laser-etched with decorative patterns (see right). 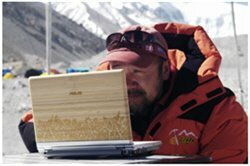 To prove the systems robustness, Asus sent one up with an Everest expedition. According to Stuff.co.uk, it was due to be launched sometime in June this year, but that hasn't happened yet. They are in that order for a reason - reducing resource usage is best, followed by reusing resources, followed by recycling resources. A good example of this phenomenon is when Wired magazine pointed out that buying a second hand car might well be more environmental than buying a new Prius hybrid. And similarly, buying a second hand laptop is probably better than forking out for a new Ecobook. Computer Exchange have a website and various shops in the UK, including one on Tottenham Court Road in London. The laptops come with a 12 month warranty. I picked up a little Toshiba from there, and have no complaints. Laptopshop.co.uk have a page of refurbished laptops for sale, and also offer a 12 month warranty. Refurbished isn't necessarily quite the same as second hand - sometimes it means the device was returned to the manufacturer for repairs, but sometimes it means it didn't meet initial production standards and had to be re-worked - but its still better than buying new. I got a cheap Acer from them, which I was very pleased with right up until it got nicked. Ebay is, of course, an obvious place for second hand laptops. 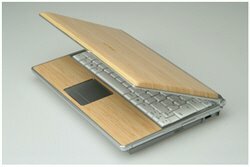 I found this Ebay shop called Enviro Friendly Computing who specialise in ex-demo, refurbished and repaired laptops. The warranties vary from 3 months to 1 year. I bought a great little ex-demo HP Pavillion from them. When you start looking at second hand laptops, you quickly discover that there are often new laptops on the market that are cheaper and have a higher spec than the second hand ones. I guess this happens because specifications and standards are always improving so fast. But if you are choosing based on environmental criteria, then it makes sense to pay a bit more for a product with lower environmental impact. The 'EcoBook' has now been launched as the Asus U6. They have had to ditch a lot of the bamboo apparently due to heat management problems, and its no longer called the EcoBook. Details in this gizmodo article.